Dunmore East is a pretty fishing village about 20 minutes from Waterford (around €25 in a cab). 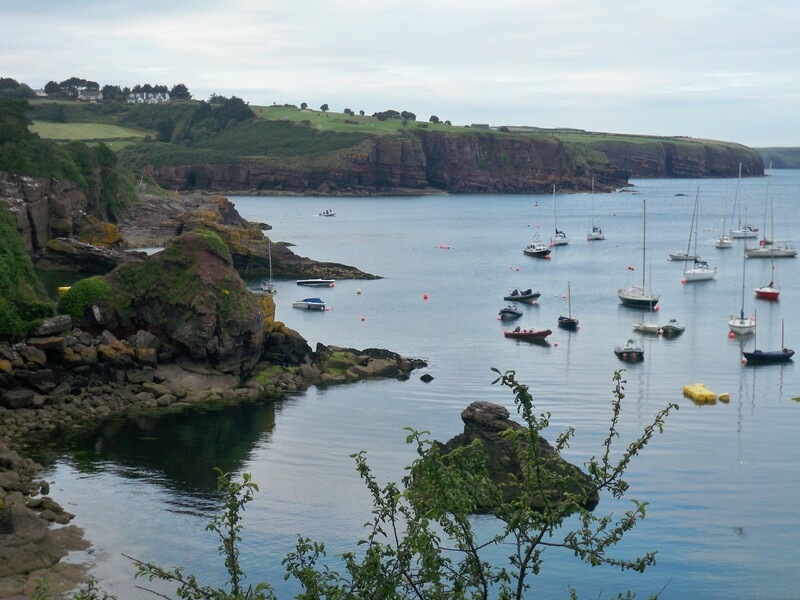 It’s a picturesque spot with thatched cottages , a small harbour and a pretty coastline of sandy coves cutting into stratified cliffs of grey and reddish rock. People come here from all over Ireland for a seaside escape. I’ve eaten a couple of times at The Strand Inn, which describes itself as one of the best seafood restaurants in Ireland. The window tables and outside terrace have nice views over the largest cove and the broad sandy beach. Sadly the food was a bit of a letdown and in 2010 four of us scored our respective mains of (pre-shelled) prawns in garlic, monkfish, and lobster a rather sad C.
However the starters of steamed mussels (supposedly with ginger and black beans but more noticeably in stock with cream) were great and got an A from two of us. The three bottles of Chilean Villa Montes Cabernet Sauvignon we got through were also very nice. The bill came to about €45 each for two courses and wine. In 2011 two of us had the Plaice, rolled and stuffed with minced prawn and crab, and scored it a B but three others had the fish pie which was obviously out of the freezer and quite watery and so only got a C.
These came with a huge overkill of good potatoes in various forms, the garlic and buttered versions being the best, and a tiny plate of mediocre steamed veg. However, the service has always been pleasant, if overbusy as the pub is usually overun with locals and visitors. We had to wait 20 minutes as they’d mislaid our reservation. The Guinness was a great consolation of course and a shot of Red Breast 12 year-old Irish Malt hit the spot. I’d definitely come again but perhaps seek suggestions next time, or choose from the specials board which we noticed hanging below the bar on the way out, the waitress and manager having been too busy to point it out. A chaotic but lovely spot, which I’d be happy to go back to.